The situation with the road at the end of Wangi Point has become somewhat of a debacle. If you've travelled along there recently you'd know that some of the potholes are almost big enough to swallow a school bus! This Mexican stand-off needs to end. 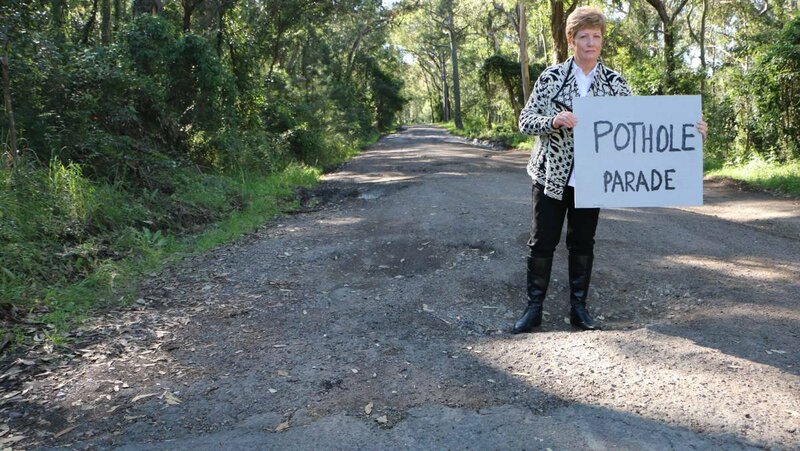 The road belongs to National Parks and the State Government so they should decide quickly whether they're going to maintain the road or pay Lake Macquarie council to do it for them. Like I said in this article, written by David Stewart at The Lakes Mail, the community doesn't care who owns the road, they just want it fixed. I agree wholeheartedly and will keep pushing for an outcome. STATE MP Greg Piper has called for Lake Macquarie City Council and the state government to sort out the jurisdictional impasse preventing repairs to one of the most pot-hole ravaged roads in the city. Reserve Road, at Wangi Wangi, is a 250-metre long minefield. It links Watkins Road, on the northern side of Wangi Point, with Dobell Drive, on the southern side of the peninsula. Deep and dangerous pot holes punctuate the road surface. The road runs through Lake Macquarie State Conservation Area, which makes it the responsibility of the National Parks and Wildlife Service (NPWS). So the council has no obligation to maintain the road, and NPWS has no responsibility to maintain the road as a “main thoroughfare”. Mr Piper says the stand-off cannot continue. “The Wangi community really doesn’t care who owns the road, they just want it fixed and made safe and I agree entirely,” Mr Piper said. Hunter Valley Buses, which has about 70 bus movements along the section of road every week – including school buses – is considering abandoning the route. “We can’t have a situation where school buses or regular bus services have to be cancelled because pot holes in the road can’t be filled,” Mr Piper said. “I’ve spoken to the [Environment] Minister [Gabrielle Upton] and I’ve spoken to Lake Macquarie Council and I’ve urged them to find a solution quickly because it’s a totally unreasonable situation for the community and the bus company to be in. Mayor Kay Fraser said any push for council to maintain the road sounded like cost shifting. ?“This is about cost shifting. Again,” Cr Fraser said. “We’d be very reluctant to put ratepayers’ money into a state road – a road that we don’t own. “Ratepayers expect us to be looking after streets that they live in, and that council owns and maintains. The mayor said the state government should be concerned about Reserve Road. “They should be there now. They should be worried about this road,” she said. Parliamentary Secretary for the Hunter, Scot MacDonald, said he was happy to liaise with Mr Piper to help broker a solution. Mr Piper has not received a response from council or the Minister to his correspondence.